Home » Uncategorized » 5 Games In. A new Quarterback and Random Thoughts on the Double Blue. 5 Games In. A new Quarterback and Random Thoughts on the Double Blue. Toronto – It’s 5 games into the CFL Season and life for the Toronto Argonauts is good but as always, can be better. The team sits third in the East with a 3 and 2 record but only 1 and 2 at home. Factor in that the two home losses came against divisional rivals Hamilton and Ottawa and you know the term “what if” has at times been prevalent inside the Argo locker room. The Double Blue face their first true test of adversity this weekend when they travel to Ottawa for a Sunday night match up at TD Place. 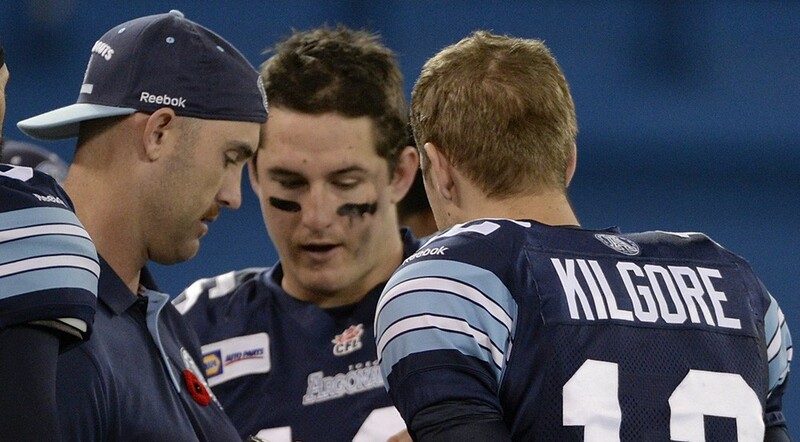 While reigning MOP Henry Burris returns for the REDBLACKS the Argos will be starting rookie quarterback Logan Kilgore as Ricky Ray rehabs an MCL sprain that will likely see him miss the next 3 to 6 weeks. From a fan perspective the timing couldn’t be worse. Ray was coming off his best game of the season vs Montreal, and looked to continue that momentum with a rematch of their week 4 game vs Ottawa. Also a Ray injury only reignites the conversation as to it was the right call to let Trevor Harris leave via free agency. Much of that is all arm chair discussion and my points will be simple and concise. Just like Ray, Trevor Harris is also hurt. Injuries are a fluke thing and the Argos were likely at some point going to play some games with their backup quarterback. Also don’t be afraid of the unknown. We might not know much of the Logan Kilgore. But we also didn’t know much of Zach Collaros and Trevor Harris. This we do know: Toronto can develop a young quarterback and they can protect them too. Kilgore is in his second season with the team. His knowledge of the playbook should be at a good comfort level and Coach Milanovich along with Offensive Coordinator Marcus Brady won’t ask him to do something he can’t. Expect quite a few screen passes, and dump offs to hopefully set up some big throws down the field. Anthony Coombs – The 2014 3rd overall pick can’t be satisfied with the start of his season. So far the slot-back from Manitoba has accumulated only 7 receptions for 49 yards in 5 games this season. The organization gave up a ton to acquire him on draft night and so far the results haven’t matched the cost. He has an ability to make people miss though, I’d personally like to see him catch balls out on the flat and see how many yards he can get after the catch. With their receiving group decimated with injuries there is no reason Coombs can’t take on a more substantial role. Devon Wylie – Quite the debut for the receiver out of Fresno State as he recorded 5 receptions for 55 yards and a touchdown. TSN drew a comparable to Weston Dressler. I also think he has a little bit of Luke Tasker in him too. Either way Wylie showed a good knack of finding an open spot and being a sure handed receiver. Making the spectacular play can be uplifting to a team. But not making the routine play can be heart breaking. Wylie hopefully can be a reliable target that will only help Logan Kilgore steer the offense. BMO Field – I almost hate to bring up the attendance at BMO this season but here is the reality. Yes opening night was awesome and the other 2 weeks not so much. But so far the Argos have played 3 home games on a Thursday, Wednesday and Monday night. Those nights don’t scream football especially when conceivably every tailgater has to work the next day. 3 of the next 4 games are weekend dates and I expect to see better crowds on those days.